From her very first book, Serve It Forth, M.F.K. Fisher wrote about her ideal kitchen. In her subsequent publications, she revisited the many kitchens she had known and the foods she savored in them to express her ideas about the art of eating. M.F.K. Fisher among the Pots and Pans, interspersed with recipes and richly illustrated with original watercolors, is a retrospective of Mary Frances Kennedy Fisher's life as it unfolded in those homey settings—from Fisher's childhood in Whittier, California, to the kitchens of Dijon, where she developed her taste for French foods and wines; from the idyllic kitchen at Le Paquis to the isolation of her home in Hemet, California; and finally to her last days in the Napa and Sonoma Valleys. M.F.K. Fisher was a solitary cook who interpreted the scenario of a meal in her own way, and M.F.K. Fisher among the Pots and Pans provides a deeply personal glimpse of a woman who continues to mystify even as she commands our attention. 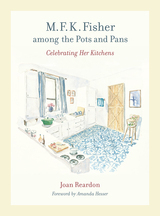 Joan Reardon is a culinary historian and author of Poet of the Appetites: The Lives and Loves of M. F. K. Fisher and M. F. K. Fisher, Julia Child, and Alice Waters: Celebrating the Pleasures of the Table, among other books. Avram Dumitrescu is an Irish artist and illustrator specializing in food, architecture, and animals. His work has been featured in the Southern Review, Gastronomica, The Writer magazine, and the Ulster Tatler.